As I was heading out of aerials workout at CATS on Thursday, Jasmine wanted to make plans to get together soon. "Tomorrow night! ", I exclaimed, fists overhead. "No, that's the going away party for Nathan." "Saturday night!". "OK." And so it was arranged. 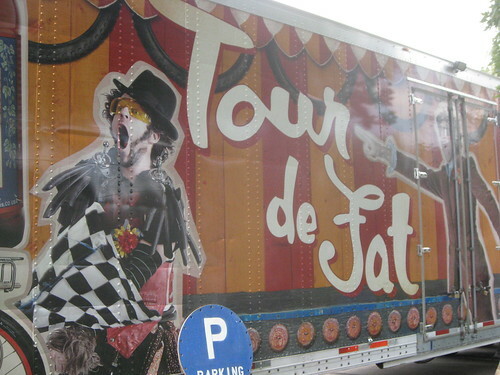 However, on Friday I caught word that Saturday was the annual New Belgium Brewery Tour de Fat festival. I had never been but it seemed like a damned-fun time. Jasmine was down, so that became our last-minute plan. I asked her if she could whip up some last minute costumes, knowing full well this is the kind of thing one can expect from Jasmine. Saturday morning I got in a relaxed mindset that we'd be rolling in late and actually managed to suppress the annoying train conductor in my psyche who usually insists on everything running like clockwork. Jasmine had alarm clock issues and was running late. She came to my place and we made breakfast of scrambled eggs with peppers and onions and some beer bratwurst. Then we threw our bikes on the rack and off we went. Before the highway we stopped at the Indulge Bakery looking for some good road snacks. We didn't really find anything too exciting though, so I grabbed a Snickerdoodle and chocolate chip cookie, then up the highway we went. I had been tweeting back and forth with my Twitterverse Doppelgänger @rockstar_ who lives up in Fort Collins about the logistics. Plan was to park in his driveway which is close to the parade route. However, we didn't arrive in the neighborhood until after 11 AM and streets were crowded with bikers and closed to cars, so we just found a spot where we could squeeze in behind another car by driving up under their bike rack and having our bike rack sticking slightly into an alley a bit. Jasmine had already put on her eye makeup in the moving car, which I found to be both impressive and risky. 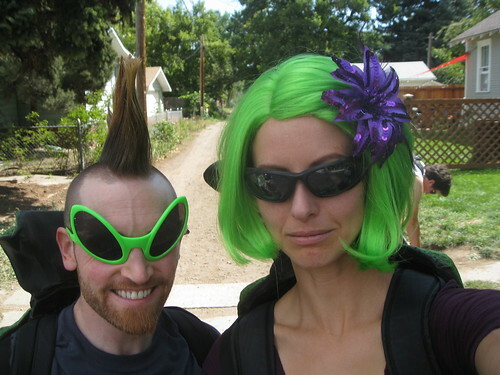 Jasmine had two giant foam-rubber beetle shells you wear like a backpack, so we suited up in those and Jasmine helped me erect the mohawk, which as you will see below, is pretty damned long these days after more than a year of growth. We joined into the bike parade, which we were pleased to find was still going strong. We pedaled along Mountain Ave several blocks toward the main festival grounds, where we dismounted and locked our bikes in the gigantic Wal-Mart-sized parking lot that had been outfitted with wall-to-wall bike racks to accommodate somewhere between 20K and 40K people's worth of bikes. We turned quite a few heads, drawing a lot of comments on Jasmine's amazing superhero boots, our beetle shells, and my hair. We found a slack line where Jasmine played for a bit, then wondered over to the side stage, where a juggling performance by The Handsome Little Devils was about to begin. While we waited for the show, Alex spotted my hair in the crowd and came to hang out with us. 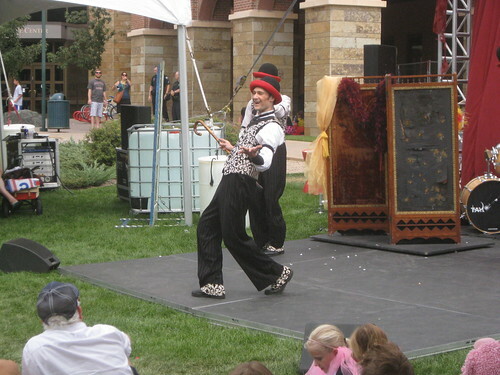 The show was great, with some good juggling acts, well-made costumes, and really funny antics. After the show we went back to the main stage area, grabbed some festival food for lunch, and hung around a bit. Karl Denson's Tiny Universe, a really good jazz/funk band, was playing. Alex and Jasmine monkeyed around on the playground a bit. Jasmine did some trapeze tricks on a bar in the playground and several people approached her begging her to do it again so they could video it. We were getting a bit drowsy, so we went back to the car, drove over to City Park which was not part of the festival, and took a nice nap in the grass. Then we drove to Lory State Park for a quick hike before the park closed for the evening. We drove back to Louisville, stopped at the grocery store to get ingredients for a green curry, and went home to cook it up. It was a delicious dinner, but it was almost 10 PM by the time we ate it.